A delicious, gluten free dish that serves as an appetizer or main meal! In a non-stick skillet over medium heat, heat peanut oil. Add the onion. Cook for 3 minutes, or until translucent. Add the ground turkey. Cook for 5 minutes, stirring occasionally to crumble the meat. Sit in garlic, soy sauce, vinegar, ginger, sesame oi, salt and pepper. Combine thoroughly. Cook for additional 2 minutes. Stir in water chestnuts. Cook for another 2 minutes before removing from heat. 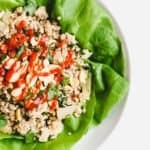 Scoop turkey mixture into lettuce wraps, adding cilantro and peanuts on top. Top with sriracha if desired!